1944 - PB4Y-1s from squadrons VB-108, VB-109, and VD-3, conduct a low-level bombing raid on Japanese positions on Wake Island. 1968 - Four North Vietnamese trawlers attempting to simultaneously infiltrate supplies into South Vietnam were detected. Three of the trawlers were sunk in battle on the following day and one survived by turning back. February 29th—the day where 'this time last year' and 'this time next year' do not apply. Leap Day is like the Olympics, it happens every four years and nobody notices until it's over. Leap Day is like a Kobe Bryant pass, it only occurs once every four years. Lousy leap year—it makes you wait one more day for payday. The government says I can't get my pension yet, as I am only 17½ . I hate being born on a leap year. All my friends are 70. Shout out to all the people born on February 29th in 1928 celebrating their 21st birthday! May the fact that your birthday comes once every four years be a passing excuse for your infantile behavior. On the positive side, you are fortunate in that you only have to put up with incessant Facebook wishes every four years. Smart men get married on 29th of February—they will only have to celebrate their anniversary every four years. There have been 499 leap years since Caesar created it in 45 BC. Without the extra day every four years today would be July 12, 2017. The chances of a leap birthday are one in 1,461 -- long odds for getting the short end of the stick. Imagine waiting four years for your real birthday and hearing endless jokes about being three when you're really 12. The longest time between two leap years is eight years. The last time this happened was between 1896 and 1904 and it won't happen again until 2096 to 2104. People born on leap year's day are called leaplings. 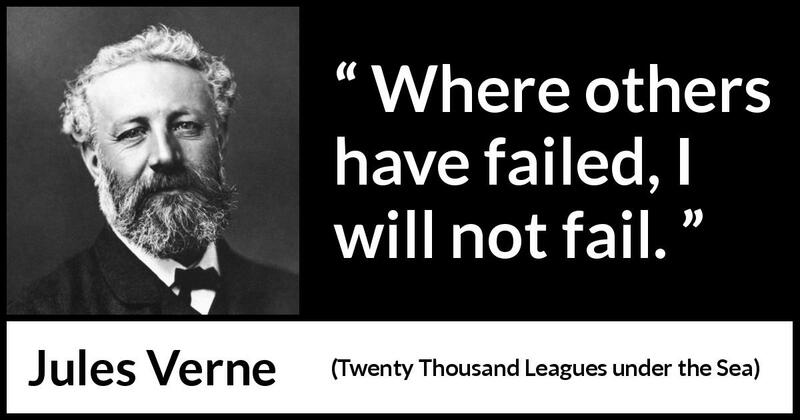 Besides Leap Day, February 29th is also called Femandnesday. What year do frogs like best? Leap year. Finally, I can't believe it's been only four years since I told the same leap year jokes. 1942 - U-656 becomes the first German submarine of World War II to be sunk by Naval air (VP-82). 1954 - 1st of 6 detonations, Operation Castle nuclear test. 1991: Following USS Missouri's (BB 63) bombardment of Faylaka Island during Operation Desert Storm, hundreds of Iraqi soldiers wave white flags and surrender to the battleships Remotely Piloted Vehicle (RPV) flying overhead. York, Maine becomes the first incorporated American city. Sarah Goode, Sarah Osborne and Tituba are arrested for the supposed practice of witchcraft in Salem, Mass. Ohio becomes the 17th state to join the Union. In France, Napoleon creates an imperial nobility. Napoleon lands at Cannes, France, returning from exile on Elba, with a force of 1,500 men and marches on Paris. German troops enter Paris, France, during the Franco-Prussian War. Congress passes the Civil Rights Act, which is invalidated by the Supreme Court in 1883. Albert Berry completes the first in-flight parachute jump, from a Benoist plane over Kinlock Field in St. Louis, Missouri. The Allies announce their aim to cut off all German supplies and assure the safety of the neutrals. The Korean coalition proclaims their independence from Japan. The Allies reject a $7.5 billion reparations offer in London. German delegation decides to quit all talks. The Lindbergh baby is kidnapped from the Lindbergh home near Princeton, New Jersey. Germany officially establishes the Luftwaffe. Bulgaria joins the Axis as the Nazis occupy Sofia. Japanese troops land on Java in the Pacific. The British RAF conducts strategic bombing raids on all European railway lines. 1,000 Black students pray and sing the national anthem on the steps of the old Confederate Capitol in Montgomery, Ala.
A grand jury indicts seven of President Nixon's aides for the conspiracy on Watergate. Bosnian Serbs begin sniping in Sarajevo, after Croats and Muslims vote for Bosnian independence. were themselves being destroyed by newly airborne P-40's . . firing intermittently . . while weaving slightly above aircraft coming off the runway. We had just moved to near Milne Bay, East New Guinea . . in early November 1942 . .
And because we were getting new airplanes . . Daly, Griffin, Helveston and myself were on R & R in northern Australia. Our new campsite was in the largest coconut grove in the world, owned by Lever Brothers who needed it to make Palmolive soap. Our combat air strip was slashed flat out of a Lever Brothers' coconut grove with machetes and bull dozers. The Japs invaded a beach a short distance down the bay and worked their way toward our strip. Australian fighter pilots were a powerful force in turning back waves of Japanese troops. The Aussies quickly flew up in the their P-40's . . quickly took on fuel and ammo . . then pounced on the enemy. A few days later, bulldozers covered over hundreds of enemy bodies in the surrounding mud. For each body the bull-dozers covered up, it seemed another one would ' pop ' to the surface. The stench of the enemy's mortifying dead was horrible. The runways were [ PSP ] pierced steel planking with thousands of two inch holes lacing the interacting steel plates. 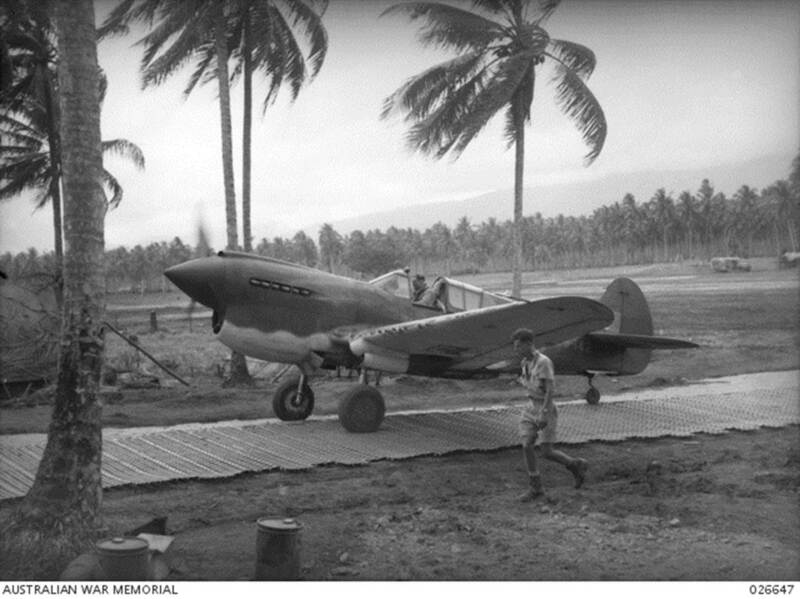 When the Aussies' P-40's landed, the jungle strip's underlying mud would ' squirt up ' through thousands of holes to completely encrust the bottoms of their War Hawks. At the end of our runway was a protective anti-personal mine field. And the whole mine field was . . L-I-V-E ! sliding into the explosive mines. Either take off—or you and your Lightning would invade the mine field. the inevitable jungle disease coming around the corner. Our recently constructed air base did not have search lights for its defense. So almost every night, Tokyo Joe would come over and circle around in the dark. Then circle again. Each time, we were forced to run over, drop into a slimy slit trench,and hunker down to become bait for many thousands of malaria-laden mosquitos. But in this case, at our other airstrip at Milne Bay . . the Jap bombers throbbing engines' propellers . . always . . pointed at our pink bodies. —FEEL . . too good. On the 7 February 1943 we got the word that we were using the Goonie Bird . . South to Mareeba to pick up our new Lockheed P-38s. Half of us went on leave, while the others stayed behind to check out in the new P-38s . . now being ferried in one or two at a time. 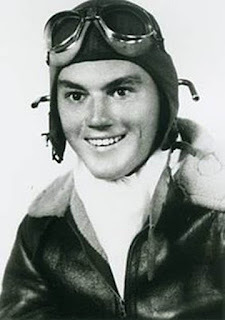 We were all Second Johns . . We had been overseas since graduation [12 Dec 1941.] Our former Classmates who stayed in the States for a handful more weeks, would come over as Captains and Majors. Here we were with our brown bars. There were vague rumors . . we might get promoted. Maybe there would be a chance for a miracle ! But while I was down in Australia on R & R, I decided that a promotion might be in order for us. And I considered it a once in a lifetime opportunity—so I went over to the base PX and I stocked up on every officer rank emblem in the PX's inventory. I bought First Lt bars . . Captain tracks . . Major Leaf . . Lt. Col Leaf, ' Bull Colonel ' Eagle . . and a General's Star. When our ten wheeler arrived, I handed Lundy the Lt Col Leaves, Daly became a full Colonel. And I was Brigadier General for a day. Lt Col in the front seat, he came to attention nearly knocking himself out with an attempted rifle salute. The he looked in the back of the truck and here was a Bull Kernal and a General Officer. He almost messed his uniform up. He could not get us through the gate soon enough. After we had traveled just a few yards, he was on the telephone—warning ahead about the rankest invasion. As soon as we hit camp, I walked by a tree and picked up a straight dead limb, every General has to have a swagger stick, and found out that our buddy, Johnny Roberts, was having a meeting with green new pilots who had just gotten off a troop boat from the States. I went blustering in. Danny's eyes enlarged to saucer proportions. I gave them all "at ease", and started my little speech : " I guess the first thing you notice is my youth. Well, it is hell up there [we had not seen an enemy for weeks ] and those of you that survive will also quickly climb the rank ladder, as I have. ASSUMING that . . you . . survive ! " I had one or two other smart remarks, then turned the meeting back over to Danny.
" What if you had gotten caught ? " They would have sent me back to that nasty island—where they were going to send us back, in any case. A few days later, I came down with a spell of malaria, and I was taken off of flying status. So I did not check out in the P-38 until we returned to Port Moresby. My check-out was not routine. up on a P-38 Lightning's wing, and Cragg showed us where the instruments were and their normal operating ranges. So we crawled up in there, started up, taxiied out and took-off. my thinking . . that . . maybe I needed to check my own airplane. And sure enough . . some guage . . near my right flight boot . . was reading double what it should. So we both aborted. 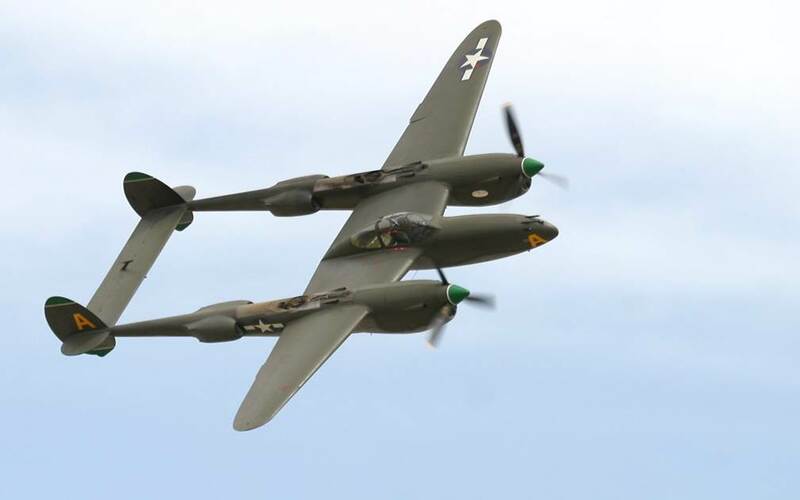 That was the only time I aborted during the many hours I flew the P-38. And I never did find out what that instrument was, down there near my boot. So in the future I simply ignored where it. I figured if it was so damn important, ' they ' would have stuck it in a more obvious location. 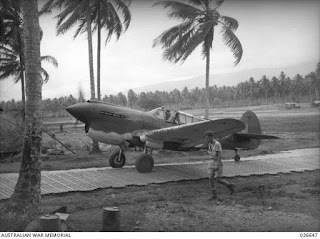 One of the main duties of the pilot, while slow-timing an engine, was to be on the look-out for the herd of cattle running wild in the coconut plantation. But they beat the heck outta eating Spam. Several years ago, 90 year old M.F. Kirby demonstrated remarkable recall of odd ball experiences shaping his military career as a Fighter Pilot Ace. To keep his stories from vanishing, a book, titled simply ' Kirby ' contains a collection of narratives shared by Kirby from his combat experiences as a combat fighter pilot. a ride . . posed as his kid ' cause you had to be with an adult ' . " That was my first experience flying. " Kirby later saved two dollars . . got a ride from a neighbor who was building up flying time . . of course, Kirby asked him if be could move the stick when airborne. And Kirby became hooked on flying airplanes ! Thought you might enjoy perusing this list. A bit of Naval history for you. To put in context, as a sea story it must begin: Now this is no s**t.
Five cannibals were employed by the Navy as translators during one of the island campaigns of World War II. When the Commanding Admiral of the task force welcomed the cannibals he said, You're all part of our team now. We will compensate you well for your services, and you can eat any of the rations that the Sailors are eating. So please do not indulge yourselves by eating a Sailor. Four weeks later, the Admiral returned and said, You're all working hard, and I'm very satisfied with every one of you. However, one of our Chief Petty Officers has disappeared. Do any of you know what happened to him? The cannibals all shook their heads. After the Admiral left, the leader of the cannibals turned to the others and said, Which of you idiots ate the Chief? A hand raised hesitantly, to which the leader of the cannibals replied, You idiot! For four weeks we've been eating Ensigns, Lieutenants, Lieutenant Commanders, Commanders, and even one Captain, and no one noticed a thing. And then YOU had to go and eat a Chief. Item Number:1 Date: 03/01/2017 AFGHANISTAN - AMERICAN, AFGHAN OFFICIALS OPTIMISTIC LATEST MILITARY LEADERSHIP CHANGES WILL PAY DIVIDENDS (MAR 01/S&S) STARS AND STRIPES -- Both U.S. and Afghan military officials predict that recent changes in the leadership of Afghan security forces should lead to battlefield gains this year, reports the Stars and Stripes. Ineffective and corrupt commanders in the military and security forces has been widely blamed for poor performance against Taliban militants, who now hold more Afghan territory than at any time since 2001, officials said. "In the Afghan National Army, we are looking at 15 Kandak (battalion) commanders being replaced over the last three months, at least three brigade commanders and one corps commander," Command Sgt. Maj. David Clark, the senior enlisted leader for NATO and U.S. Forces-Afghanistan, told the newspaper. The new leaders have already demonstrated improved performance, he said. "I see more of the platoons taking the fight to the enemy; the tactical failures are coming down," said Clark, as quoted in the paper on Monday. At the Interior Ministry, "tens of people were changed," including several directors general and a number of provincial and district police chiefs, said a ministry spokesman. Three senior leaders and several low-level commanders with the Afghan air force have been replaced since December, officials said. Gen. John Campbell, the previous commander of the coalition in Afghanistan, last year told Congress that poor leadership was responsible for most of the issues plaguing the Afghan security forces. Item Number:2 Date: 03/01/2017 AFGHANISTAN - RIVAL TALIBAN FACTIONS CLASH IN HERAT PROVINCE (MAR 01/KP) KHAAMA PRESS -- A group of suicide bombers, apparently Taliban fighters, attacked a rival compound over the weekend in Afghanistan's western Herat province, reports the Khaama Press (Afghanistan). Late Sunday night, at least two suicide bombers attacked the compound of a rival Taliban group led by Mullah Rasool in the Shindand district, according to provincial officials. There was a gunfight that lasted at least 30 minutes before the suicide bombers were killed. At least three militants loyal to Mullah Rasool were also killed, the provincial officials said. This is not the first time that rival Taliban factions in the region have clashed, said analysts. Item Number:8 Date: 03/01/2017 IRAN - FOLLOWING AGREEMENT, REVOLUTIONARY GUARD NAVY WILL BE IN CHARGE OF SEIZING TRESPASSING VESSELS (MAR 01/PRESSTV) PRESS TV -- The Islamic Revolutionary Guards Corps (IRGC) navy will now have the responsibility of seizing vessels that trespass on Iran's territorial waters, reports Press TV (Iran). Following the signing of an agreement on Tuesday with Iran's Ports and Maritime Organization, the IRGC navy will be authorized to seize all vessels intruding on Iranian waters in the Persian Gulf, said Rear Adm. Ali Fadavi, the command of the service. The seized vessels will be handed over to the organization, which oversees affairs related to Iranian sea ports and commercial shipping and is part of the Ministry of Roads and Urban Development. The partners also agreed to set up new procedures to cooperate on maritime issues, including environmental damage and search-and-rescue operations, said the admiral. Item Number:10 Date: 03/01/2017 PHILIPPINES - ARMY EYES RECRUITING NEARLY 14,000 THIS YEAR (MAR 01/UPH) UPDATE.PH -- The Philippine army has decided to recruit 13,910 new soldiers this year, reports Update Philippines. That total will include 349 junior officers, 1,069 soldiers for the newly organized 54th Engineer Brigade, 8,892 soldiers for a special quota approved by President Rodrigo Duterte and 3,600 for annual replacements, said an army spokesman on Wednesday. Most of the recruits will be with infantry, cavalry and artillery units, while others will take up engineering, communications, logistics and other administrative roles, the spokesman said. Ten percent of the total will be allocated for women and 5 percent for indigenous peoples, he said. A trainee candidate will receive a monthly salary of about US$334. That goes up to US$460 when the candidate becomes an enlisted private. Item Number:16 Date: 03/01/2017 TAJIKISTAN - RUSSIANS STATIONED WITHIN TAJIKISTAN TO ASSIST WITH SECURITY ON AFGHAN BORDER, SAYS PUTIN (MAR 01/TASS) TASS -- President Vladimir Putin has promised Russian assistance to help Tajikistan protect its border with Afghanistan, reports the Tass news agency (Moscow). Putin met this week with Tajik President Emomali Rahmon in Dushanbe, the Tajik capital. Both countries are concerned about the spread of terrorist groups in Afghanistan, as well as the growth of drug-trafficking and other crime, Putin said on Monday. The threat includes the Islamic State, which is banned in Russia. The leaders agreed to bolster joint efforts to protect the Tajik-Afghan border, using the assets of the Russian 201st Military Base in Tajikistan, in particular, according to Putin. The agenda also included efforts to help restore peace and stability in Afghanistan, said Rakhmon. Item Number:20 Date: 03/01/2017 USA - NAVY ORDERS 7 GROWLER ELECTRONIC ATTACK, 5 SUPER HORNET FIGHTER JETS (MAR 01/DOD) DEPT. OF DEFENSE -- The Naval Air Systems Command has awarded St. Louis-based Boeing a contract for additional electronic attack and fighter aircraft, reports the Dept. of Defense. The $679 million deal covers seven Lot 40 EA-18G Growler aircraft and associated electronic attack kits and five F/A-18E Super Hornet fighters. Work under the contract is scheduled to be completed in February 2019, noted a Pentagon release on Feb. 27. NAVAIR awarded another $9.6 million contract to Boeing on Monday for an engineering change proposal for the design, development and structural analysis of the necessary modifications to the pre-cost reduction initiative aircraft wing structure in support of the Super Hornet service life-extension program. Work under that contract is due to be completed in January 2020.